New York Court of Appeals Holds that Reinsurance Contracts are Governed By Ordinary Principles of Contract Interpretation … Implicitly rejecting the Bellefonte rule, the Court rules that Excess v. Factory Mutual did not create a special rule capping reinsurers’ obligations for defense costs in addition to limits. Glob. Reinsurance Corp. of Am. v. Century Indem. Co., No. 124, 2017 WL 6374281 (N.Y. Dec. 14, 2017). In its controversial 1990 decision in Bellefonte Reinsurance Company v. Aetna Casualty & Surety Company, the Second Circuit held that the amount stated in the “Reinsurance Accepted” provision of a facultative certificate was an absolute cap on the amount recoverable from the reinsurer. From the beginning, Bellefonte has been criticized as improperly capping reinsurance coverage, even where the underlying policy covers defense costs in addition to limits. In 2004, the New York Court of Appeals followed Bellefonte in Excess Insurance Company v. Factory Mutual Insurance Company. Although Excess involved declaratory judgment expenses under a property policy, the Court of Appeals followed Bellefonte in holding that the reinsurer’s obligations for both indemnity and expenses were capped by the facultative certificates. In Global Reinsurance Corporation v. Century Indemnity Company the issue arose again. The Southern District of New York held that facultative certificates providing “reinsurance accepted” of “$250,000 part of $500,000” unambiguously capped the reinsurer’s liability at $250,000 for both indemnity and defense costs. On appeal, the Second Circuit questioned whether Bellefonte was correctly decided. However, because the reinsurance contracts at issue are governed by New York law, the court perceived the Excess decision as a potential barrier to revisiting Bellefonte. The case now returns to the Second Circuit. Full disclosure: Chaffetz Lindsey LLP filed amicus briefs on behalf of several reinsurance brokers in the Second Court and The Court of Appeals. Foreign insurer required to post pre-answer security before moving to compel arbitration … New York Insurance Law § 1213(c) applies to policies issued through foreign brokers. In re MF Global Holdings Ltd., 569 B.R. 544 (Bankr. S.D.N.Y. 2017). In In re MF Global Holdings Ltd., the Bankruptcy Court for the Southern District of New York held that New York’s pre-answer security statute, N.Y. Ins. Law § 1213(c), required an unlicensed Bermuda insurer to post a $15 million bond before moving to compel arbitration. Section 1213(c), which is similar to pre-answer security statutes in many states, applies to litigation against unlicensed foreign insurers. Specifically, the statute provides that where an insurance policy is “delivered” in New York by a foreign insurer not licensed in New York, the insurer may not file “any pleading in any proceeding against it” until it either posts a bond “sufficient to secure payment of any final judgment” or “procure[s] a license to do an insurance business in” New York. The court also rejected the insurer’s argument that a motion to compel arbitration was not a “pleading” under Section 1213(c). Rather, the court followed New York cases construing the term broadly. Following the court’s decision, the insurer posted the requisite bond and moved to compel arbitration. The court granted the motion to compel, finding that the question of coverage under the insurance policy was not a “core” bankruptcy proceeding. 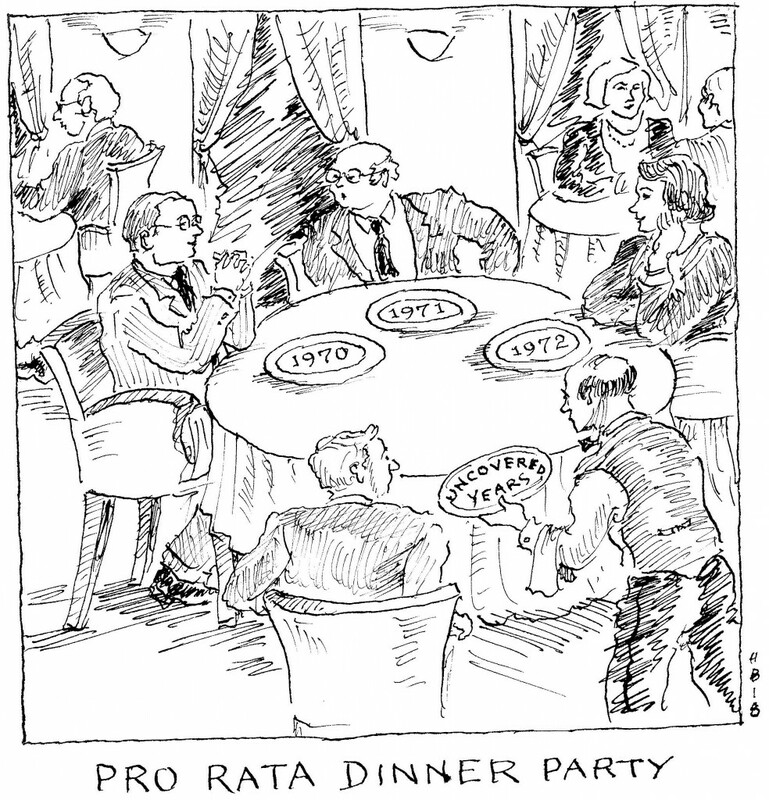 Accordingly, the parties were ordered to arbitrate their coverage dispute in Bermuda. Following Viking Pump, the Second Circuit applies “all sums” allocation to long tail environmental losses … “Prior insurance” and “continuing loss” provisions required all sums allocation. Olin Corporation v. OneBeacon America Insurance Company, 864 F.3d 130 (2d Cir. 2017). In Viking Pump, the New York Court of Appeals held that there was no per se rule under New York law requiring long tail losses to be allocated on a “pro rata” basis. Rather, the Court concluded that specific terms of the policies at issue – notably, the non-cumulation clause – required “all sums” allocation. 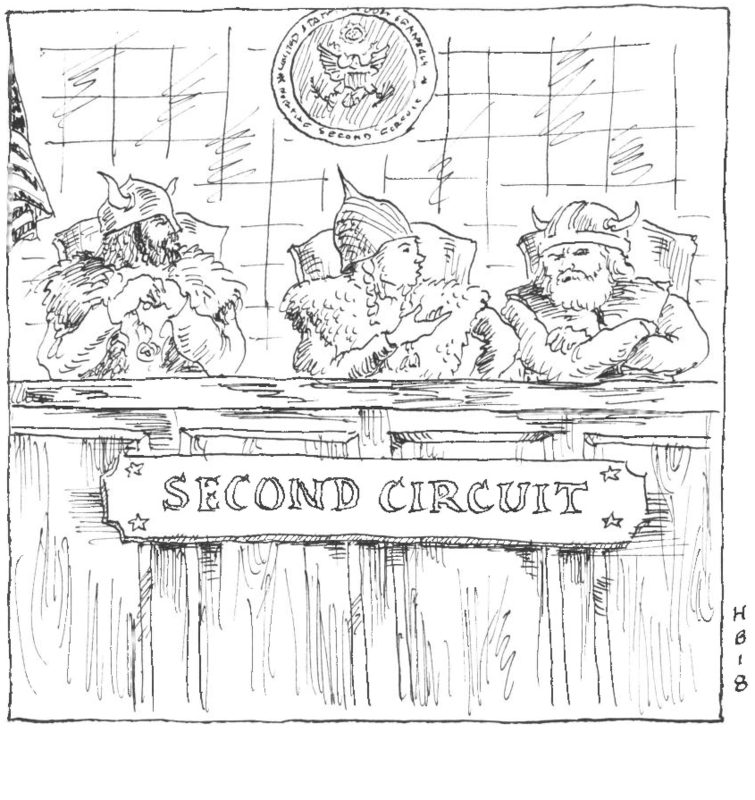 In Olin Corporation v. OneBeacon America Insurance Company, the Second Circuit applied Viking Pump to a long-running environmental coverage dispute. The dispute involves coverage under excess policies issued in 1970 and 1972 for contamination that began prior to commencement of the 1970 policy and extended beyond the expiration of the 1972 policy. The Second Circuit found that two policy provisions required an “all sums” allocation. First, the policies each contained a “prior insurance” clause providing that coverage under the policy would be reduced by “amounts due” under earlier policies covering the same occurrence. Second, each policy contained a “continuing loss” clause providing coverage for all losses resulting from an occurrence taking place during the policy period, including those losses incurred after the policy expiration date. These provisions, taken together, indicated that each policy was intended to respond to “all sums” arising from property damage occurring at least in part during the policy period. Arbitration award vacated for “evident partiality” based on party-appointed arbitrator’s non-disclosure of its relationships with individuals affiliated with cedent … Parties’ agreement to use non-neutral party-arbitrators did not preclude application of “evident partiality” ground for vacatur. Certain Underwriters Members at Lloyd’s of London v. Insurance Company of the Americas, Case No. 16-CV-323(VSB), 2017 WL 5508781 (S.D.N.Y Mar. 31, 2017). In Certain Underwriters Members at Lloyd’s of London v. Insurance Company of the Americas, the Southern District of New York granted the reinsurers’ motion to vacate an arbitration award. The court found vacatur was warranted because of “evident partiality” on the part of the cedent’s party-appointed arbitrator. Second Circuit asks New York Court of Appeals whether 27-year old precedent in Bellefonte is correct … Federal Appeals court asks New York high court whether, under New York law, a “Reinsurance Accepted” provision in a facultative certificate caps reinsurance recovery for defense costs. Glob. Reinsurance Corp. of Am. v. Century Indem. Co., 843 F.3d 120 (2d Cir. 2016), certified question accepted, 28 N.Y.3d 1129 (2017). 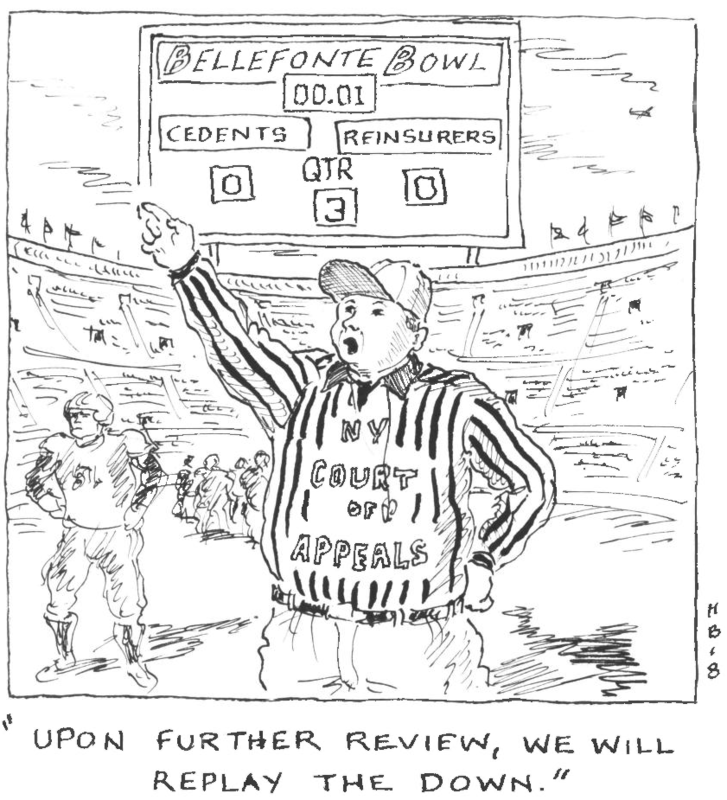 In its controversial 1990 decision in Bellefonte Reinsurance Company v. Aetna Casualty & Surety Company, the Second Circuit held that the amount stated in the “Reinsurance Accepted” provision of a facultative certificate was an absolute cap on the amounts recoverable from the reinsurer, even where the reinsured policy provided coverage in excess of the limits of liability for expenses such as defense costs. 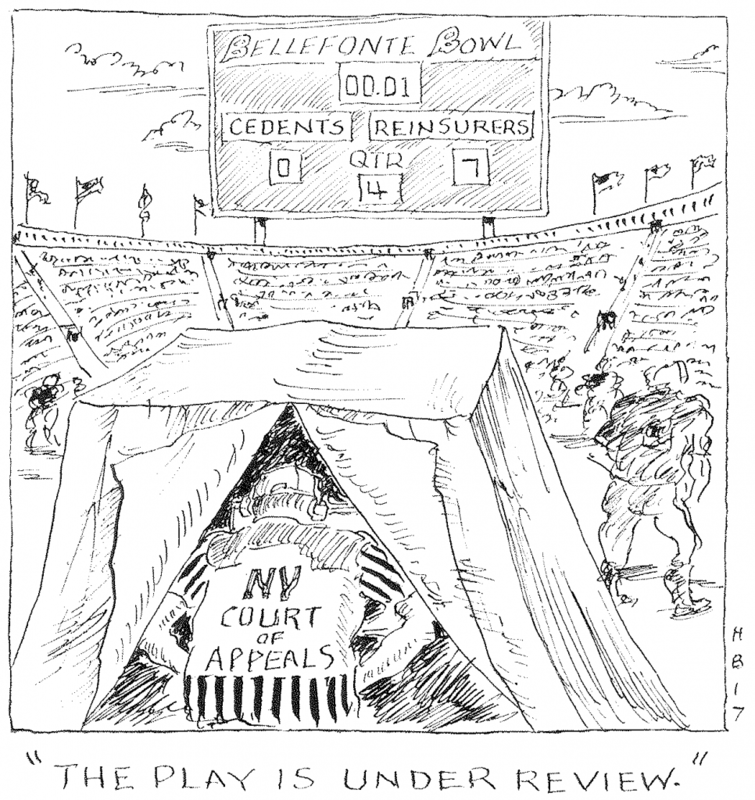 In 1993, in Unigard Security Insurance Company v. North River Insurance Company, the Second Circuit followed Bellefonte. And in 2004, in Excess Insurance Company v. Factory Mutual Insurance Company, the New York Court of Appeals followed suit. Now, though, the Second Circuit has questioned whether Bellefonte is correct. 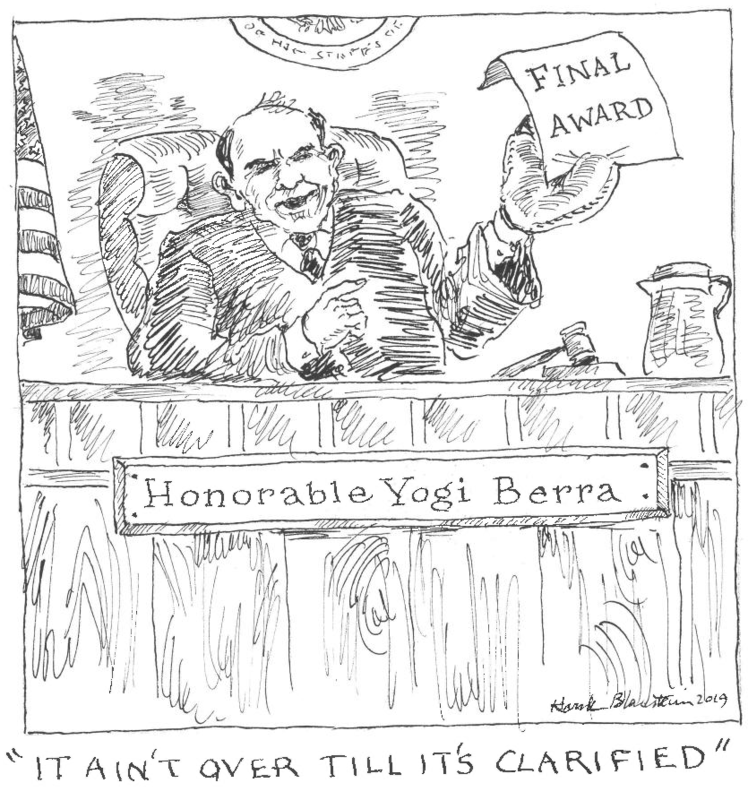 In Global Reinsurance Corporation v. Century Indemnity Company, the District Court followed Bellefonte and Unigard in holding that, by providing coverage of “$250,000 part of $500,000,” the facultative certificates at issue unambiguously capped the reinsurer’s liability at $250,000 for both indemnity and defense costs. On appeal, the Second Circuit questioned the reasoning underlying Bellefonte. Full disclosure: Chaffetz Lindsey LLP filed an amicus brief in the Second Circuit on behalf of several reinsurance brokers. Umpire’s Service as Party-Arbitrator for Separate Company with Close Relationship to Party Does Not Constitute “Evident Partiality” … Court finds vacatur of arbitral award unwarranted in the absence of familial, business or employment relationship between umpire and party. Nat’l Indem. Co. v. IRB Brasil Reseguros, ___ Fed. Appx. __, 2017 WL 421944 (2d Cir. Jan. 31, 2017). In National Indemnity Company. v. IRB Brasil Reseguros, the Second Circuit affirmed the district court’s judgment confirming three arbitral awards in favor of retrocessionaire National Indemnity Company (NICO) against its retrocedent, IRB Brasil Reseguros (IRB). IRB argued that the awards should be vacated because the umpire had been party-appointed arbitrator for Equitas Ltd. (Equitas) in one arbitration, and had accepted a second appointment from Equitas during the arbitration at issue. Equitas, which assumed older Lloyd’s business, ceded 100% of that liability – along with control over claims handling – to NICO. IRB contended that Equitas and NICO were therefore “affiliates,” and that the umpire’s appointments for Equitas created a conflict. Federal Appeals Court confirms summary judgment in favor of insurer on late-notice defense. … Court confirms that coverage may be barred by a policyholder’s failure to provide timely and adequate notice, as required under the policies. Travelers Indem. Co. v. Northrop Grumman Corp., ___ Fed. App’x. ___ , 2017 WL 391926 (2d Cir. Jan. 27, 2017). In Travelers Indemnity Company v. Northrop Grumman Corporation, the insured, Northrop Grumman, sought coverage under several CGL and environmental policies for multiple environmental claims arising at a site on Long Island. During the 1970s and 1980s the insured received notice from various government agencies about its potential liability for the contamination of the site. In the early 2000s, the insured faced several suits involving claims related to soil and groundwater pollution at the site. The insurers defended principally on the ground that Northrop had not complied with its notice obligations. The district court agreed, and the Second Circuit affirmed. The court found that the insured did not provide adequate notice of the agency communications because (1) the insured’s broker had sent notice to one insurer at the wrong address and there was no evidence that the insurer ever received it; and (2) the notice to another insurer did not identify the specific policy under which notice was being provided. The Second Circuit also affirmed the lower court’s holding that notices made between 47 days to nine years after the insured became aware of a potential claim were untimely as a matter of law. Insurer does not, as matter of law, waive a late-notice defense by failing to identify it in its disclaimer letters. … NY Court of Appeals reaffirms that in property coverage disputes, common law waiver standards govern, not “heightened” statutory disclaimer requirements. Estee Lauder Inc. v. OneBeacon Ins. Group, LLC, 28 N.Y.3d 960 (2016). Here, the Appellate Division found that the insurer waived its late-notice defense by excluding it from its disclaimer letters. Reversing, the Court of Appeals emphasized that the common law waiver standard requires “an examination of all factors.” Because the insurers had raised the late-notice defense in communications prior to the disclaimer letter, the Court held it could not find that the insurers had “clearly manifested an intent to abandon their” defense as a matter of law. Id. New York rule on allocation and exhaustion: Follow the contract … Court of Appeals clarifies that policy language, rather than per se rule, determines allocation and exhaustion requirements for long-tail asbestos claims. In re Viking Pump, Inc., 27 N.Y.3d 244 (2016). In In re Viking Pump, Inc., the New York Court of Appeals addressed whether New York law requires “all sums” or “pro rata” allocation of coverage among successive insurance policies for long-tail asbestos claims. The Court also addressed whether “vertical” or “horizontal” exhaustion triggered coverage under excess insurance policies covering those years. 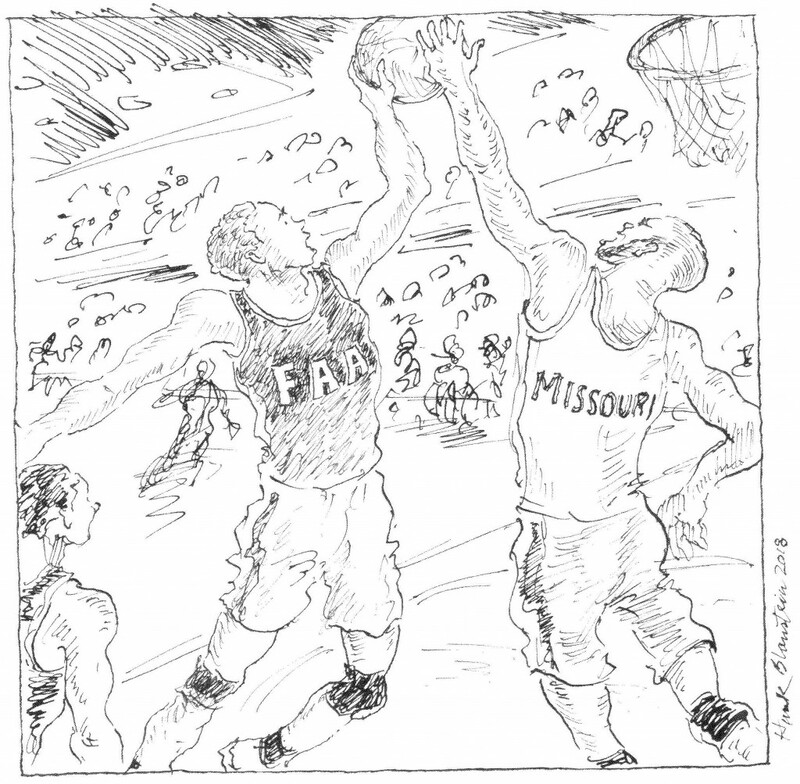 In both instances, the Court’s answer was a common judicial refrain–it depends. The Court held that there is no “blanket rule,” but rather the language of the applicable policies will determine the method of both allocation and exhaustion. 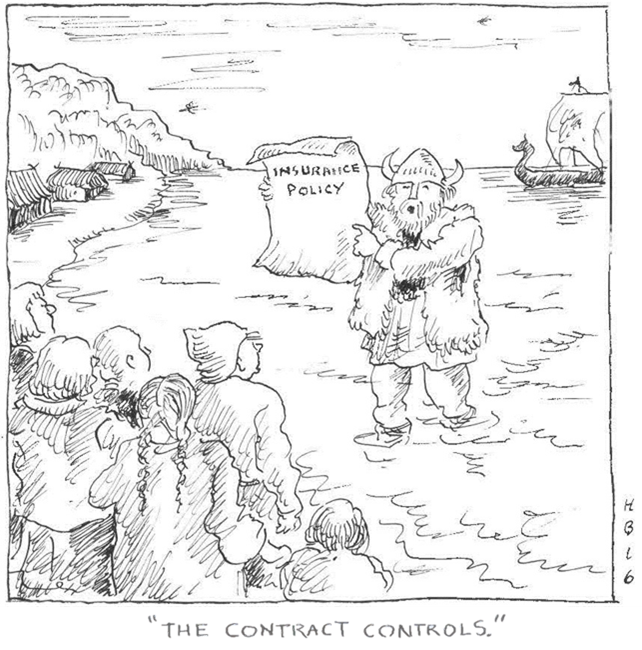 In Viking, the Court found that “non-cumulation” or “anti-stacking” language in the policies at issue required an “all sums” allocation. Where multiple policies were triggered by the same ongoing exposure to asbestos, the “non-cumulation” provisions prevented the insured from recovering more than one limit from consecutive policies. This, said the Court, is inconsistent with the “pro rata” allocation method it had previously endorsed. With respect to exhaustion, the Court again held that the language of the policies controls. The Court found that “vertical” exhaustion was required because the excess policies provided that they would attach upon exhaustion of the specifically scheduled underlying policies from the same year. The Court also found that vertical exhaustion is “conceptually consistent” with all sums allocation, which permits the insured to seek coverage through the tower of the policies issued in a particular year. 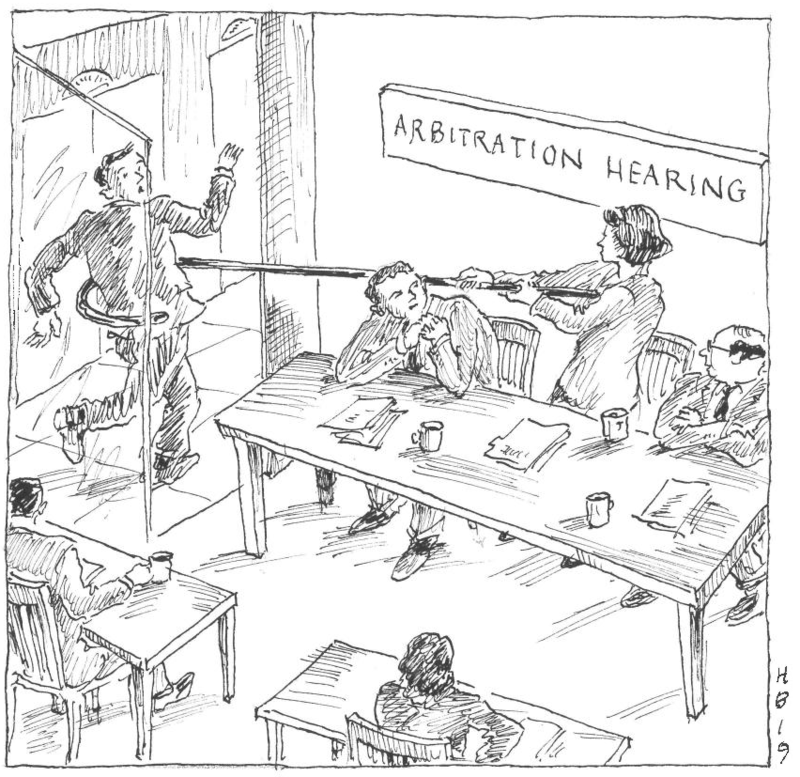 Ex parte communications with arbitrator cause Sixth Circuit to vacate arbitration award. … Sixth Circuit vacates reinsurance arbitration award based on ex parte communications with party arbitrator following interim award. Star Ins. Co. v. Nat’l Union Fire Ins. Co. of Pittsburgh, PA, __ Fed. Appx. __, 2016 WL 4394563 (6th Cir. Aug. 18, 2016). Parties to reinsurance arbitrations often assume that ex parte communications with their party arbitrators may resume once an award is issued. In Star Insurance, the Sixth Circuit called that assumption into question, vacating a reinsurance arbitration award because of ex parte communications that took place after the panel’s issuance of an interim award. Notably, the court applied Michigan arbitration law rather than the FAA. And, under Michigan law, the court ruled that vacatur is required where ex parte communications “violate the parties’ arbitration agreement.” Here, the court found that the communications violated the agreement because, under the panel’s scheduling orders, ex parte communications were to end after submission of the initial briefs. Importantly, the orders did not expressly authorize the resumption of ex parte communications after the interim award. Finding that the scheduling orders were unambiguous, the court rejected an argument that the ban on ex parte communications was implicitly lifted once the panel issued its interim award. The court also ignored the Panel’s after-the-fact ruling that the scheduling orders did not bar ex parte communications following the award. Out-of-state plaintiffs may invoke Connecticut’s pre-pleading security statute … District of Connecticut finds statute requires unauthorized insurer (or reinsurer) to post security before filing pleadings in an action against it. Statute applies regardless of plaintiff’s citizenship. Select Ins. Co. v. Excalibur Reins. Corp., 2016 WL 2731658 (D. Conn. May 10, 2016). Connecticut’s pre-pleading security statute requires an unauthorized insurer (or reinsurer) to either post security or secure proper authorization to do business in Connecticut before filing any pleadings in an action against it. CONN. GEN. STAT. § 38-27(a). In its suit against Excalibur for breach of a reinsurance contract, Select moved to require Excalibur to post pre-pleading security. Excalibur opposed the motion on the ground that Select was neither a “citizen of” nor an authorized insurer in Connecticut. Magistrate Judge Joan Margolis granted Select’s motion for security because the statute has no requirements regarding the plaintiff’s citizenship. On Excalibur’s Motion for Reconsideration, Judge Margolis confirmed her initial ruling. The court made clear that “[t]he statute’s requirements are directed not to the party initiating the action, but toward the party against whom the action is brought.” District Court Judge Jeffrey A. Meyer approved and adopted the Magistrate’s rulings. NY trial court issues rulings on follow-the-settlements and late notice. … New York Supreme Court finds that language in fac cert was “following form” rather than “follow-the-settlements” clause, and that a disadvantageous commutation was not prejudice sufficient to support a late notice defense. Granite State Ins. Co. v. Clearwater Ins. Co., 2016 N.Y. Slip. Op. 31160(U) (Sup. Ct. 2016). In Granite State, the New York Supreme Court denied cross-motions for summary judgment involving facultative reinsurance coverage for asbestos claims. The court’s opinion included significant holdings on follow-the-settlements and late notice. The follow-the-settlements holding focused on the nature of a follow-the-settlements clause. The provision at issue stated that the reinsurer “shall follow [Granite State’s] liability in accordance with the terms and conditions of the policy reinsured hereunder.” The court ruled that this language was a “following form,” not a “follow the settlements,” clause. As a result, the court declined to apply the follow-the-settlements doctrine, and held that the reinsurer could challenge its cedent’s allocation of the underlying losses. The late notice holding focused on what constitutes prejudice. Applying California law, the court found that prejudice is a required element of a late notice defense. The reinsurer argued that it was prejudiced because, before it received notice of the claims, it commuted a retrocessional contract that might have covered them. Citing a California insurance coverage decision, the court held that “actual and substantial prejudice” arises only “where the insurer actually demonstrated that there was a substantial likelihood that it could have either defeated the underlying claim . . . or settled the case for a smaller sum . . . .” Under this principle, the court ruled that a disadvantageous commutation does not qualify as prejudice.